Fast-forward to 2017, and Billie Jean is walking the red carpet in New York City with actress Emma Stone for the premier of the movie by the same name. The film is about social change, equality and Billie Jean’s life. Clearly, the message is about more than just tennis. 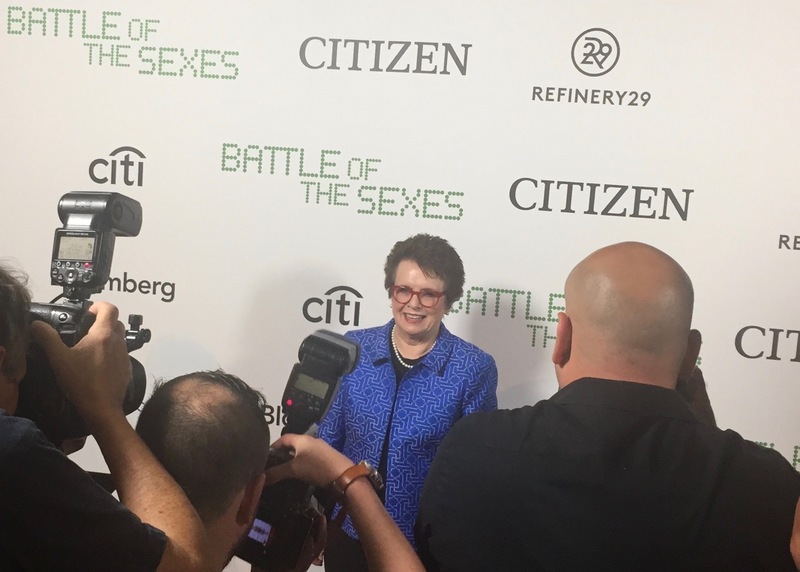 We all know Billie Jean King is heralded for winning 39 Grand Slams (combined singles, doubles and mixed doubles), has a National Tennis Center named after her in Flushing Meadows, founded the Women’s Tennis Association, is a lifelong proponent of gender equality and LGBTQ rights, and so much more. However, her underlying story of vulnerability, personal motivation, and the courage to accomplish what she has is far less known. At the movie premier, Billie Jean spoke about her unique, purpose-driven reason for persevering beyond all odds. I call this a person’s Big Y(why). She went on to say that when she was 12-years-old, she had an epiphany while playing in Los Angeles. Everyone was wearing white shorts, white socks, white tops and everyone’s skin color was white. With this Big Y of equal rights, Billie Jean King became the quintessential example of someone who is “More Than an Athlete” … an athlete who brings her whole self to the sport. She doesn’t just bring her talent, technique and skills. She brings her spirit, story, soul and self. Billie Jean’s story illustrates how obstacles, fears and myths, whether on or off the court, can get in our way. But whenever athletes break out of slumps, play freely, and reach the next level, it is because they brought their whole selves to the competition. They metaphorically used their “more” as rocket fuel to propel them forward, just like Billie Jean did. So often in society, we look to accolades, trophies, championships and highlights on ESPN to define an athlete’s worth. Through this narrow lens, we categorize athletes to fit what we imagine a champion to be. Billie Jean King didn’t get caught up in this trap. Her story illustrates what was really at work behind her forehand, backhand and great net game—her courage to stand out and be herself when things got rough. She made hard choices to become an advocate for causes that are sometimes frowned upon. In the early 1970s, Billie Jean campaigned for equal prize money, which then led to championing the Woman’s Tennis Association (WTA) and the infamous match against Bobby Riggs. She continues to stand up for gender equality, gay rights, and runs a leadership initiative called “Lift. Learn. Lead.” to achieve inclusive leadership. During the post movie Q&A panel, she spoke about the uncertainty of pioneering causes that are not always popular. Shonda Rhimes, famous television producer, personally invited by Billie Jean, spoke to that when she added an important note about confidence. Many wonder how Billie Jean had the fortitude to fight for social causes while playing professional tennis. From my lens, she recognized she was more than an athlete and understood that Big Y that she identified as a 12-year-old was her real motivation to achieve. Billie Jean is truly “More Than an Athlete,” an example of bringing who you are to what you do. She is an inspiration to us all.